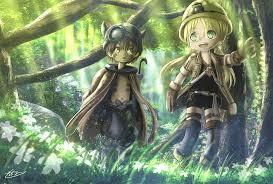 In my point of view, Made in Abyss Manga is a tale of a journey to the land of no return. Also, giant mind-reading porcupines, do not forget those. It is bizarre, beautiful, creative, painfully emotional and odd (did I mention carnivorous porcupines? It is one of my all-time favorites, so allow me to tell you why. So, what does make Made in Abyss so special? It is a weird and fascinating Location With its own laws of physics, mythology, and ecosystem. Stunning flower meadow, eager to kill you dead, maybe worse? A legendary weapon that misfires regularly and gets lost all of the time? It's remarkable. design and composition, exquisite shadows and lighting - this manga has it all and then some. It's a visual feast putting to shame at least 90 percent Of all of the other manga out there. in your face when you turn the next page? Not a chance. scared to turn a page but unable not to? You'll Have this pleasure. that is something you can stomach you're in for an experience well worth your while. spine-chilling - it'll sweep you off your feet and drag you down into a world of sinister beauty you will never forget.